Let me begin this review by saying that anyone who travels to Cuba needs to be flexible or choose a different destination...the Cuban government imposes changes on cruise ship schedules, which is no fault of the cruise line and those changes can/will happen to any cruise ship. Our Pearl Mist voyage had two major changes: 1) We sailed in a clockwise direction (the opposite of the planned schedule) which put us in Santiago de Cuba rather than in Havana for New Year&apos;s Eve. The cruise line arranged for us to attend a fabulous local outdoor party at a 5 star Melia hotel, with 2 bands, unlimited cocktails, and appetizers. It was all very upscale and festive. 2) Instead of the three days we were scheduled to be in Havana, our ship was allowed just 12 hours at one of the two cruise docks. 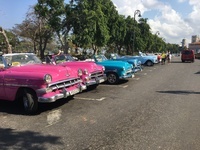 So we were driven on a 31/2 hour bus ride through the countryside (that ride gave us the opportunity to see the Cuban interior rather than coastline) and the cruise line put us up at a lovely 5 star, centrally located, Havana hotel, the Parque Central. The cruise line had 15 days notice to arrange this alternate plan at an expense to them of $100,000! I call this going above and beyond! Our cabin was slightly smaller than we&apos;ve had on other cruise lines, but very adequate including a balcony with a table and 2 chairs. We ordered room service breakfast one morning and had a delightful meal on our patio. We were on Deck 3 and found no need to use the elevator...most activities are on Deck 2 and 4; The dining room is on Deck 1. There is an elevator for those needing it, but we didn&apos;t see it getting a lot of use. We thoroughly enjoyed our meals...the food was expertly prepared and the service was the same as you would find at a 5 star restaurant. The meal choices were varied, 3 courses, and delicious. Breakfast offered both a buffet and table service. We were asked to order lunch and dinner at breakfast to allow the chef to prepare, but were told we certainly could change our choices at mealtimes. Half portions were also available. We had a cocktail hour from 5-10:30 each evening with top shelf liquor: Glenleviet, Grey Goose, etc., a pleasant surprise. Which brings me to additional charges...there are NONE! They don&apos;t even ask for a credit card at boarding because there is NOTHING to pay for, including laundry! The only exceptions are gratuities, which can be left on a credit card charge, dollars, or euros and tips for tour guides and bus drivers. All of our tour guides spoke very good English and were quite knowledgeable and friendly. Because this cruise is a people to people trip, our tours included artist co-operatives and studios, botanical gardens, etc. but these were mixed in with city and landmark tours, an evening at the Tropicana, and a fabulous tour in a classic car. Because we chose full day tours (half day options are available) we had lunch at a variety of local restaurants and paladores. Some, of course,, were better than others, but all included beer, wine, and cocktails, and provided another opportunity to see how Cubans live. The Cuban people are lovely, welcoming, and happy. We always felt very safe, so much so that we ventured out on our own in the evening. Entertainment consisted of 2 musicians who played music of the era of the guests aboard the ship. (50&apos;s and 60&apos;s rock and roll) For a small ship, the entertainment is exactly what we expected. There are lectures and classes (mojito making, salsa dancing) during the day. The guests ranged in age from 40s to 90s. Maybe this was just our cruise, but the guests were so friendly, well traveled, and so much fun and made our trip that much more memorable. The dance floor was crowded every night, maybe the top shelf liquor had something to do with that?? The cruise staff was great from the cruise directors to the waiters to the cabin stewards...They were all charming, accommodating, and professional. One note: Small ships are not as stabilized as massive ships. As were traveling around the tip of the island, the seas were a bit rough and were asked to stay off the outdoor decks for a few hours. My husband was not bothered at all, but I have a tendency to experience motion sickness. I had asked my physician for sea sick patches before we left home, and I am very happy that I did! Let me begin this review by saying that anyone who travels to Cuba needs to be flexible or choose a different destination...the Cuban government imposes changes on cruise ship schedules, which is no fault of the cruise line and those changes can/will happen to any cruise ship. Our Pearl Mist voyage had two major changes: 1) We sailed in a clockwise direction (the opposite of the planned schedule) which put us in Santiago de Cuba rather than in Havana for New Year&apos;s Eve. 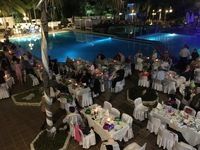 The cruise line arranged for us to attend a fabulous local outdoor party at a 5 star Melia hotel, with 2 bands, unlimited cocktails, and appetizers. It was all very upscale and festive. 2) Instead of the three days we were scheduled to be in Havana, our ship was allowed just 12 hours at one of the two cruise docks. So we were driven on a 31/2 hour bus ride through the countryside (that ride gave us the opportunity to see the Cuban interior rather than coastline) and the cruise line put us up at a lovely 5 star, centrally located, Havana hotel, the Parque Central. The cruise line had 15 days notice to arrange this alternate plan at an expense to them of $100,000! I call this going above and beyond! Our cabin was slightly smaller than we&apos;ve had on other cruise lines, but very adequate including a balcony with a table and 2 chairs. We ordered room service breakfast one morning and had a delightful meal on our patio. We were on Deck 3 and found no need to use the elevator...most activities are on Deck 2 and 4; The dining room is on Deck 1. There is an elevator for those needing it, but we didn&apos;t see it getting a lot of use. We thoroughly enjoyed our meals...the food was expertly prepared and the service was the same as you would find at a 5 star restaurant. The meal choices were varied, 3 courses, and delicious. Breakfast offered both a buffet and table service. We were asked to order lunch and dinner at breakfast to allow the chef to prepare, but were told we certainly could change our choices at mealtimes. Half portions were also available. We had a cocktail hour from 5-10:30 each evening with top shelf liquor: Glenleviet, Grey Goose, etc., a pleasant surprise. Which brings me to additional charges...there are NONE! They don&apos;t even ask for a credit card at boarding because there is NOTHING to pay for, including laundry! The only exceptions are gratuities, which can be left on a credit card charge, dollars, or euros and tips for tour guides and bus drivers. All of our tour guides spoke very good English and were quite knowledgeable and friendly. Because this cruise is a people to people trip, our tours included artist co-operatives and studios, botanical gardens, etc. but these were mixed in with city and landmark tours, an evening at the Tropicana, and a fabulous tour in a classic car. Because we chose full day tours (half day options are available) we had lunch at a variety of local restaurants and paladores. Some, of course,, were better than others, but all included beer, wine, and cocktails, and provided another opportunity to see how Cubans live. The Cuban people are lovely, welcoming, and happy. We always felt very safe, so much so that we ventured out on our own in the evening. Entertainment consisted of 2 musicians who played music of the era of the guests aboard the ship. (50&apos;s and 60&apos;s rock and roll) For a small ship, the entertainment is exactly what we expected. There are lectures and classes (mojito making, salsa dancing) during the day. The guests ranged in age from 40s to 90s. Maybe this was just our cruise, but the guests were so friendly, well traveled, and so much fun and made our trip that much more memorable. The dance floor was crowded every night, maybe the top shelf liquor had something to do with that?? The cruise staff was great from the cruise directors to the waiters to the cabin stewards...They were all charming, accommodating, and professional. One note: Small ships are not as stabilized as massive ships. As were traveling around the tip of the island, the seas were a bit rough and were asked to stay off the outdoor decks for a few hours. My husband was not bothered at all, but I have a tendency to experience motion sickness. I had asked my physician for sea sick patches before we left home, and I am very happy that I did!